TROPIKO roofing is designed so that it can be 100% open. One person can always handle opening of the roofing. After releasing a cover securing, the arch lying on the ground will be raised in its middle. After opening by 2 meters it is possible to let the cover loose – opening of the roofing is achieved by its own weight. Roofing can be opened only partially, which is very popular among our customers. 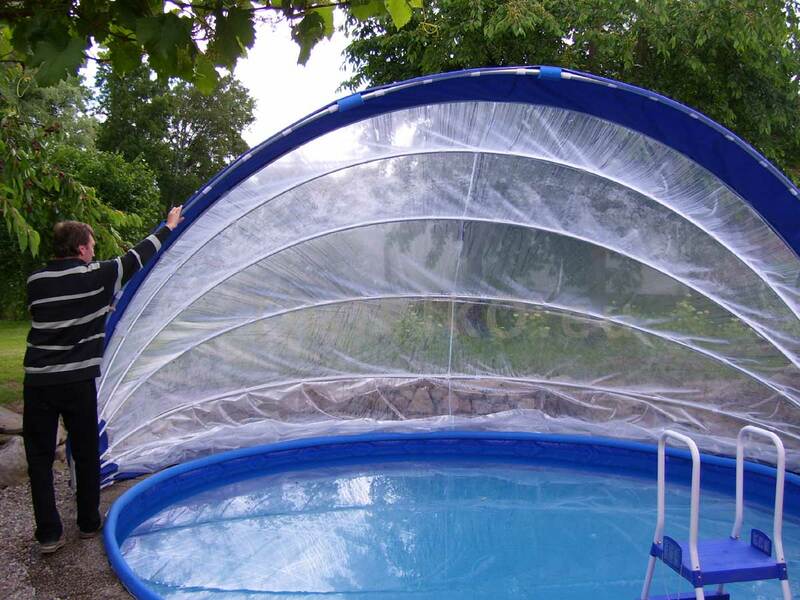 The cover opens from the ground only so that it enables entering the pool. 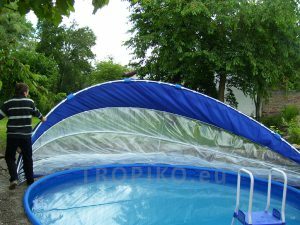 To fix this position our customers use for example a rope anchored to the first arch and in a loop on the pavement or in the ground in front of the pool. Due to balanced arches the roofing can be handled easily so that you can swim with the closed roofing and when leaving the pool you can open it easily also from the pool. 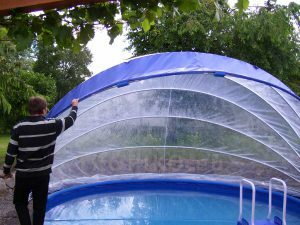 Closing of the fully open cover (pulling over the pool and a potential fixing) has to be carried out by two persons in case of the largests diameters. It is very easy to open the roofing. At this stage it is possible to let the cover loose and leave it open by its own weight. Fully open roofing, free access to the pool, undisturbed swimming. Two persons should always carry out closing of a fully open roofing of the largest pool diameters.